Here are a couple more recipes from Alice Medrich's book, Pure Desserts. So far, everything I've made from this book has been fabulous, and some of the recipes I make over and over. The cookies were just perfect and delicious--crispy-crunchy on the outside and tender on the inside. The pound cake was also lovely. 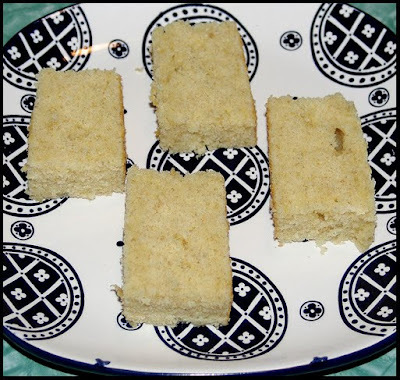 I used a square cake pan instead of a loaf pan to bake it in, so I cut it in squares instead of slices. 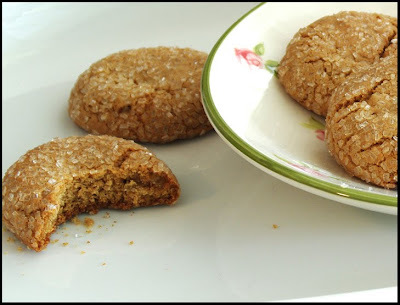 I really liked the flavor of the bourbon and the nutmeg, and I loved that the recipe calls for spelt flour. Position the racks in the upper and lower thirds of the oven and preheat to 350F. Combine the butter, molasses, both sugars, fresh ginger, and the egg in a large bowl and mix thoroughly. Add the flour mixture and ginger chips and stir until incorporated. The dough will be soft. Form the dough into 1-inch balls. Roll balls in the sugar and place them 2 inches apart on the baking sheets. Bake, rotating the sheets from back to front and top to bottom about halfway through the baking, for 10 to 12 minutes, or until they puff up and crack on the surface and then begin to deflate in the oven. For chewier cookies, remove them from the oven when at least half or more of the cookies have begun to deflate, for crunchier edges with chewy centers, bake a minute or so longer. Cool cookies on racks and store in an airtight container. Position a rack in the lower third of the oven and preheat to 350F. Line a loaf pan with parchment. In a medium bowl, whisk the milk, bourbon, eggs, and vanilla to combine. Mix together and sift the flours, sugar, baking powder, nutmeg, and salt into a large bowl. Cut the butter into chunks and add it, then pour in half of the egg mixture. Beat on low speed just until the dry ingredients are moistened. Increase the speed to medium and beat for 1 minute. Scrape the sides of the bowl. Add the rest of the egg mixture and beat for 20 seconds. Scrape the batter into the pan and smooth the surface. Bake until a toothpick comes out clean, about 55 to 60 minutes. Cover the loaf with foil after 30 minutes to prevent excessive browning. Cool the cake in the pan for 10 minutes and the cool on a rack. I LOVE gingersnaps! THey are my favorite!